Eagles fans can have a spirited debate about who was the best quarterback in franchise history. Was it Ron Jaworski or Donovan McNabb? They each led the team to a Super Bowl appearance. Wait a minute, what about Randall Cunningham? Old-timers will insist it was Norm Van Brocklin. They can go back and forth about who was the best receiver. The stats would say it was Harold Carmichael but what about Mike Quick? How about Pete Pihos and Tommy McDonald? They're both in the Pro Football Hall of Fame. And let's not forget Terrell Owens and Pete Retzlaff. It's the same thing with coaches and running backs, linebackers and cornerbacks. Fans will argue for hours. Eric Allen or Troy Vincent? C'mon, they both went to five Pro Bowls. How do you decide? But for the kicker, there is no debate: it is David Akers. He is the best kicker in franchise history. Tonight, Akers will become the first kicker inducted into the Philadelphia Eagles Hall of Fame. It is a great honor and altogether fitting. In 12 seasons with the team, he set club records for points (1,323), field goals (294), extra points (441), and regular-season games played (188). Akers was ridiculously consistent. His field goal percentage was 82.3 and it is even more impressive when you consider he played most of his games in the cold, swirling winds of Veterans Stadium and Lincoln Financial Field. Akers had streaks of 13 consecutive field goals (twice), 15 consecutive field goals (twice), and 17 consecutive field goals (twice). Chip shots or 50-yarders, it didn't matter, just put three more points on the board. "Excellence has become routine," wrote Rich Hofmann in the Philadelphia Daily News. "So (Akers) lines up for a 42-yarder into the wind and you look at the guy next to you and he says, 'Make or miss?' mostly because that's what you and the guy next to you always do when they line up for a field goal. Except when it's Akers, you just say, 'Make' and then put your head down and start counting up the number of plays in the drive. It's 'Make,' always 'Make.'" "He has become so compact and so consistent with his technique and that has been developed through really hard work," said John Harbaugh, who was the Eagles' special teams coordinator for most of Akers' career in Philadelphia. "I think he's the best in the business and the numbers bear that out." "There is no money in betting against Akers, none," Hofmann wrote. "You might as well bet against winter." Prior to Akers' arrival, the club record for points was held by Bobby Walston, who combined kicking with catching passes for 12 seasons (1951-62). Walston had 46 touchdowns to go along with his 80 field goals and 365 extra points for a career total of 881 points. That record stood for almost half a century before Akers broke it and then put it out of sight. In 2010, Akers became the first Eagle since Walston to lead the league in scoring. Akers had 143 points; Walston had 114 points in 1954. In 2004, Akers set a league record by kicking 17 field goals of 40 yards or longer. When you combine his accuracy that season (27 for 32) with the fact that his average field goal attempt was 40.8 yards (longest in the NFL), you see how much he contributed to the team's march to the Super Bowl. "If it comes down to David making a kick to win, we've got all the confidence in the world in him," said Koy Detmer, who was the holder for most of Akers' kicks. "He's made so many big kicks, game-winners, that we've always felt confidence in him." Akers recorded his 1,000th career point against the Arizona Cardinals on November 27, 2008 in an Eagles 48-20 victory. Back in January of 2007, Akers knocked in the game-winning kick to seal a 23-20 playoff victory against the Giants. Akers earned five Pro Bowl appearances as an Eagle in 2001, 2002, 2004, 2009, 2010. Akers' longest field goal make as an Eagle was a 57-yard attempt against Patriots back in 2003. Akers currently sits as the Eagles all-time leading scorer with 1,323 points. Akers spent 12 seasons with the Eagles and played in 188 regular season games from 1999-2010. After tearing his hamstring during the opening kickoff against the Raiders in 2005, Akers returned in the second half to knock in the game-winning 28-yard field goal. Akers will take his place tonight among the greatest players in Eagles history. His name will be engraved alongside those of Brian Dawkins, Chuck Bednarik, Reggie White, and the rest. But when Akers arrived in 1999, there were no trumpets blaring or flashbulbs popping. He was just another journeyman kicker looking for a job. After finishing his college career at Louisville, Akers bounced around the circuit playing one game in Washington (he missed two field goal attempts) then spending a year with the Berlin Thunder in NFL Europe. He had tryouts in Atlanta and Carolina but was not signed. Meanwhile, he taught school and waited tables at a Longhorn Steakhouse to pay the bills. But he found a home in Philadelphia. The Eagles signed him as a kickoff and long field goal specialist - their primary kicker was 39-year-old Norm Johnson - and when Akers hit a 53-yard field goal against Miami, the coaches knew they had a keeper. Akers was successful on 29 of 33 field goal attempts in 2000 and soon he was recognized as one of the best kickers in the game. 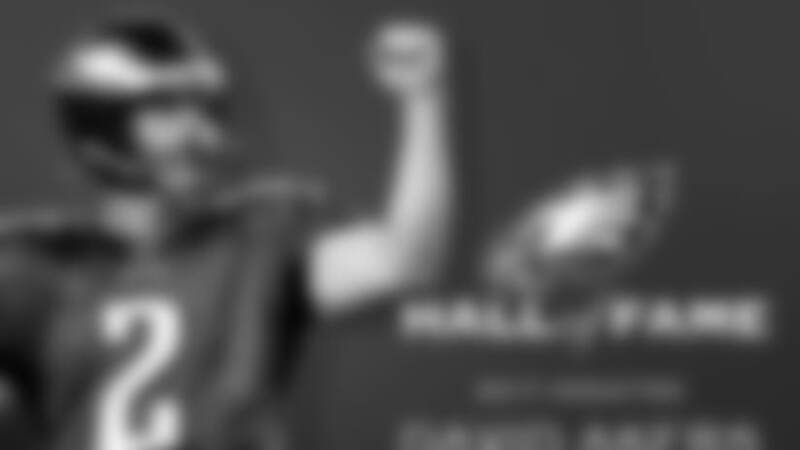 He was voted to five Pro Bowls and named a kicker on the NFL's All-Decade Team for the 2000s. "I was always confident I could kick in the NFL," Akers says, "but I didn't know if I really imagined all of this back then. It has been quite a journey." Akers also showed a toughness that earned the respect of his teammates and the Philadelphia fans. In 2005, he pulled his hamstring on the opening kickoff against Oakland and fell to the ground writhing in pain. But in the final minute, he limped onto the field and kicked the winning field goal. "I never want anyone to think I'm trying to wimp out," said Akers, who trained in martial arts which explains the bow he performed after each successful field goal. "David knows some judo and stuff like that, I've seen him take guys down in the locker room," said Mike Bartrum, who was the team's long snapper for seven seasons. "He's a kicker but he's a warrior." And now a member of the Philadelphia Eagles Hall of Fame.